The term of office is 7 years and a President may not serve more than 2 terms. The President must reside in or near Dublin. St. Patrick's Hall, Dublin Castle, is the venue for Inauguration ceremonies, at which each President takes an oath as provided in the Constitution.The President represents all the people when undertaking official engagements at home and abroad. The President is Supreme Commander of the Defence Forces. There have been eight different holders of the office - Mary McAleese is the current President. The formal powers and functions of the President are prescribed in the Constitution. The President, who does not have an executive or policy role, exercises them on the advice of the Government.There are some specific instances where the President has an absolute discretion, such as in referring a Bill to the Supreme Court for a judgment on its constitutionality or in refusing to dissolve Dáil Éireann (lower house of parliament) on the advice of a Taoiseach (Prime Minister) who has ceased to retain a majority. Additional functions can be conferred on the President by law. A special (Presidential) Commission acts whenever the President is absent. The President appoints the Taoiseach (Prime Minister) on the nomination of Dáil Éireann; and the other members of the Government on the nomination of the Taoiseach after Dáil approval. Other office holders appointed by the President, on the advice of the Government, include Judges, the Attorney General, the Comptroller and Auditor General, and Commissioned officers of the Defence Forces. The Oireachtas is the sole legislative authority of the State and comprises the President, Dáil Éireann and Seanad Éireann. The President summons and dissolves Dáil Éireann on the advice of the Taoiseach. Bills enacted by Houses of the Oireachtas are signed into law by the President. A Bill must be signed on the 5th, 6th or 7th day after it is presented to the President, but there are some situations when the President may sign a Bill earlier. The President has an absolute discretion to refer a Bill to the Supreme Court to get a judgement on its constitutionality (but not a Money Bill or a Bill to amend the Constitution). Before making a referral the President must first consult the Council of State. The constitutionality of any Bill signed following a referral may not be subsequently challenged in the courts. The President, after consultation with the Council of State, may address the Houses of the Oireachtas (parliament) on any matter of national or public importance. The text of any such address must be approved by the Government. The President represents all the people and does so in many different ways, for example when receiving foreign Heads of State on visits to Ireland or when making State Visits abroad. These and other visits abroad provide valuable opportunities to promote Ireland's interests in the international arena and to strengthen links with the Irish Diaspora around the world. Irish public and private enterprises frequently organise promotional events to co-incide with Presidential visits abroad. At home the President undertakes a wide range of engagements with particular emphasis on valuing the contribution of local community and self-help groups and in promoting peace and reconciliation throughout the island of Ireland. Whether participating in formal ceremonial, addressing international conferences or meeting people in a wide range of informal settings, the President is giving expression to the undertaking in the oath of office to "dedicate my abilities to the service and welfare of the people of Ireland". 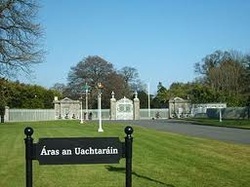 Virtual Tour of Aras an Uachtarain, Click here. If any of those is unable to act, the President of the High Court, the Leas (Deputy) Ceann Comhairle and the Leas (Deputy) Cathaoirleach, respectively, can act as members in their place. The Constitution provides for a Council of State to aid and counsel the President on all matters on which the President may consult them. The circumstances when the President must consult the Council of State are specified in the Constitution. The Council of State comprises three categories of members i.e. Taoiseach (Prime Minister), Tánaiste (Deputy Prime Minister), Chief Justice, President of the High Court, Ceann Comhairle (Chair of the lower house of parliament), Cathaoirleach of the Seanad (Chair of the upper house of parliament), Attorney General. Every person, able and willing to act, who has previously held office as President, Taoiseach or Chief Justice. Up to seven other members appointed by the President.